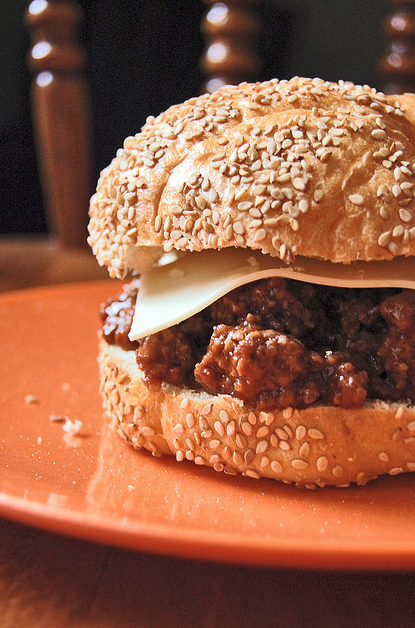 One of my favorite dinners when I was younger was sloppy joes. They are so heavenly. My mouth waters at this photo, just imagining my first bite. Here is a less fatty version that I like to call the Turkey Joe. Finely dice the onions and sauté them in a little olive oil. Once the onions are tender, add the ground turkey. Cook the turkey and break up big pieces using a spatula or spoon. Add the vinegar, sugar, ketchup, Worcestershire sauce, and hot sauce. Combine and let it simmer for a bit. Next add the can of tomato paste and combine well. You can thicken or water down the consistency to your liking by adding more or less water. Lastly add the Dijon mustard and mix well. Grate the garlic and add it to the pan. Let everything simmer for about 15 to 20 minutes on medium heat to make sure all the flavors meld and the meat is cooked through. Ladle a scoop or two of the meat unto a hamburger bun or Kaiser roll.